These builds are and will always be Intel only. Wine, and by extension, these builds of Darwine do not emulate anything. It is an API layer. For it to run on PPC, it would need to emulate some x86 stuff. This is what Darwine originally attempted to do in combination with QEMU, however it is no longer necessary with the switch to Intel. There is nothing that I can do about OpenGL not working. You can grab updated X11 packages here. There is a patch concerning libGL that has been entered into the git tree. According to the X11/XQuartz mailing lists, it will be released sometime around April 1st. This patch should hopefully fix the problem. Leopard, Darwine 0.9.58, Freetype 2.3.5, FontForge py25-20080302, Symlinks fonts, Darwine SDK. Tiger should be out sometime on sunday or monday (hopefully). *Note, all data amounts are given in Gigabytes, not Gigabits. **Bandwidth Used / Day is the average of all the months, not the total added up. Some things to note are that although the overall download total decreased in February, the amount of bandwidth used is greater then in January. Also, the # of distinct or individual hosts that downloaded Darwine is greater in February then in January despite the two day difference. 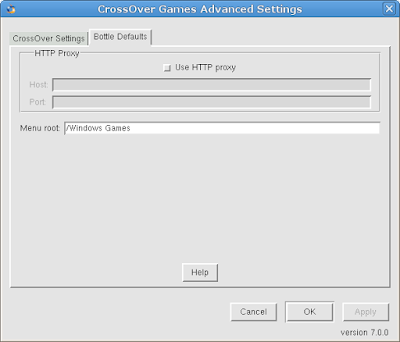 CrossOver Games is a commercial variant of Wine released by CodeWeavers with support for many of today's most popular games. 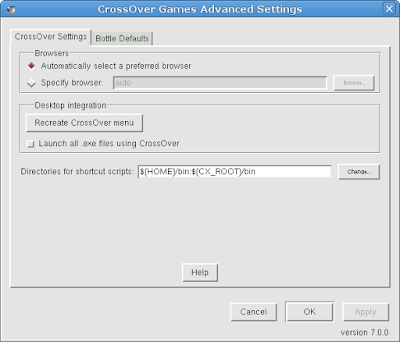 CrossOver Games is tested for performance and stability with many games such as Guild Wars, Eve Online, and Steam games like Half-Life 2 and Portal. It is also recommended that you have a web browser installed. Systems with integrated Intel GPUs will suffer some performance degradation on graphically intense games. The demo version of CrossOver has all the functions and features of the full version. Any Windows software that works on a full version will also run in the demo version, and vice versa. The important limitation of the demo version is that bottles can only be used for 7 days. This means that any Windows packages that you install using the demo version will cease to work 7 days after their installation. When a demo installation is unlocked, all existing bottles and applications are unlocked as well. 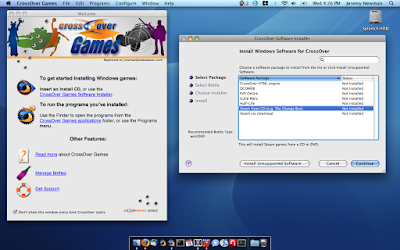 To unlock a demo, you must have a support account with CodeWeavers. You can purchase CrossOver licenses and support contracts from the vendor that provided you with your demo or directly from the CodeWeavers store. During purchase you will be asked to provide an email address and password. This address and password will be used to unlock your demo install. Many games that are not on the Supported list will still work just fine. 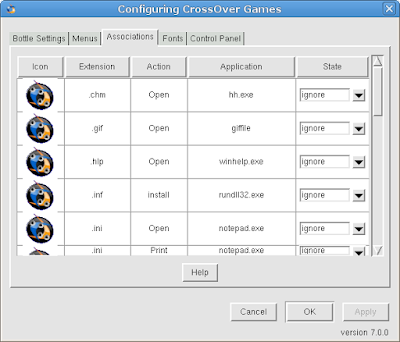 For a list of such applications, visit the CodeWeavers CrossOver Compatibility Center. At the compatibility center you can search for games, read about other users' experiences, and post tips and hints for other users. 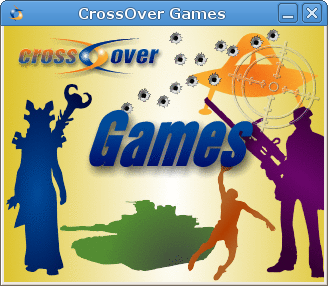 If your a current owner of CrossOver Office you will receive a complimentary copy of CrossOver Games. 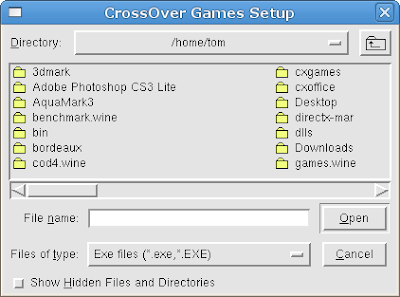 If by chance you don't currently own a copy of CrossOver Office you can purchase the stand alone Games product for only $39.95 with your purchase you will receive six months of professional support through their support ticket system, you can join in the discussions that take place at the C4 compatibility center, join a mailing list, vote for your favorite game, and much more. A purchase also goes toward helping support a full time Wine hacker! the folks at CodeWeavers have over the years given back well over 98% of all the code modifications that went into CrossOver to the Wine project. 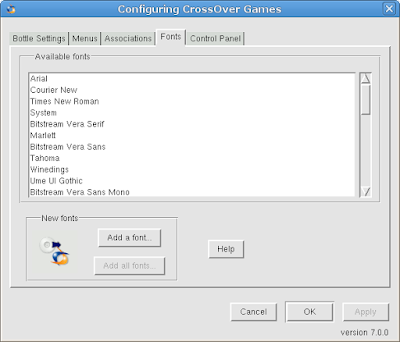 When you select "Configuration" from the menu "CrossOver Games Setup" the setup tool will start. 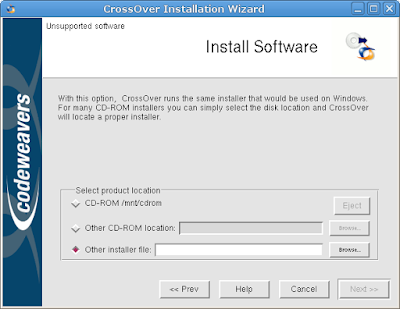 If you select install software the installation process will begin. 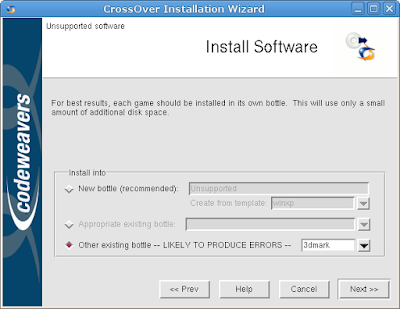 After you select the bottle you want to install your application or game into the install process will start. 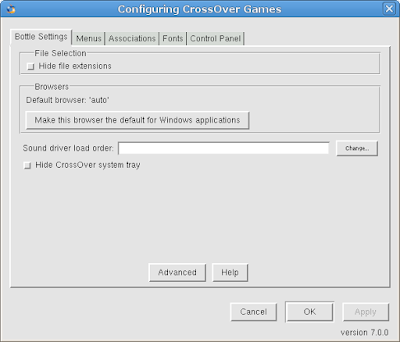 After the install has finished your application or game will be placed in the Add/Remove software window. In the Add/Remove tab you will see "Advanced Settings"
If you want to manage a bottle select the "Manage Bottles" tab and proceed. 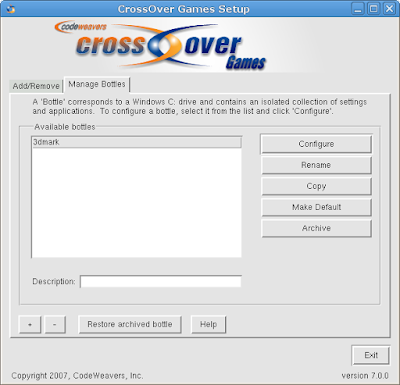 Here is some screenshots of the "Manage Bottles" tab, this is where you configure CrossOver Games to your desired liking. From the system menu if you select "Install Windows Software" you will see this window, and shortly afterwards the "Install Windows Software" window will start. 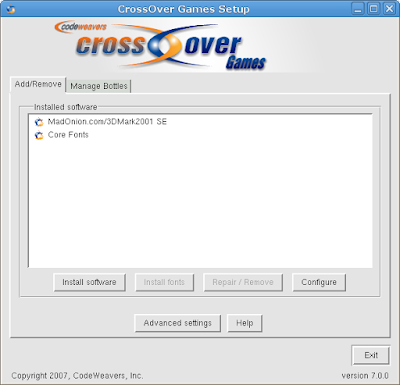 To register your copy of CrossOver Games select the "Register and unlock this demo" from the system menu. You will need to enter your email address and password and the register tool will conect to the CrossOver store and proceed with the registration. 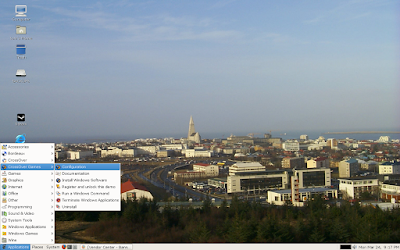 To run a Windows command select "Run a Windows Command" from the system menu. 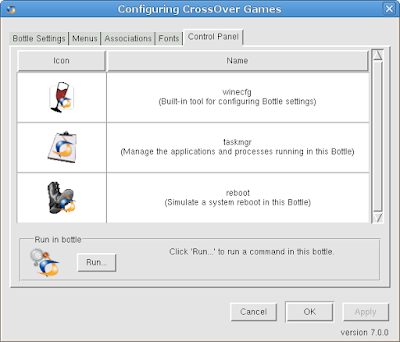 Select a bottle and then run a Windows command from that bottle. To terminate a Windows application select "Terminate Windows Application" from the system menu. To uninstall CrossOver Games select "Uninstall" from the system menu. You can choose to leave all of your previously configured bottles intact if you wish to do so. 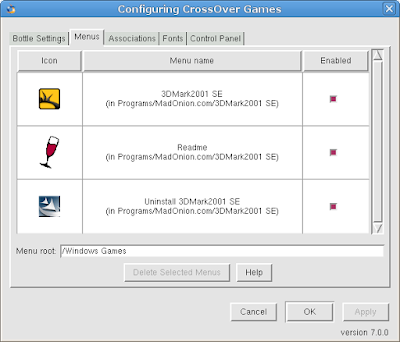 To run a Windows game from the system menu select "Windows Games" and simply navigate to the menu entry and choose the installed game. 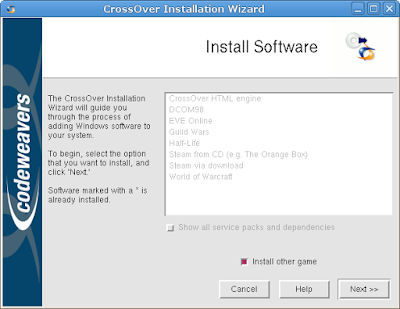 In our next post we will be doing a review of Steam, Half-Life and Half-Life 2 via the Steam install in CrossOver Games. In order to showcase the prowess of GeForce chipsets, Nvidia creates technology demos that render in real-time on the chipsets in question (while videos are usually also made available). There are many ways to prove our graphics cards with games, the famous 3dmark or benchmarks. Depending on the model of our graphics card (Nvidia or Ati), we can prove to various demos that demonstrate the full power of our gpus. This demos are modes of presentation for future models. A few days I wanted to test all the technology demos for my gpu, on this website are available all the demos: http://www.nzone.com/object/nzone_downloads_nvidia.html. 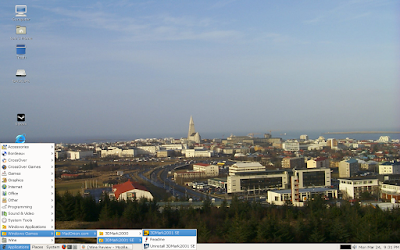 This is with a clean configuration directory and running in a 1024x768 virtual desktop (with demo Mad Mod Mike 1280x1024 virtual desktop). The installation of all these demos is not very complicated, I recommend execute by terminal. Demos can be found in / .wine / drive_c / Program Files / NVIDIA Corporation / NVIDIA Demos / "name of the demo". The quality and performance of Luna and Mad Mod Mike require pixelshaders 3.0, Transluce and Depth of Field, the fluidity that show is amazing, these demos were not working a month ago . Seeing these advances in applications 3d, I am not surprised that version 1.0 of wine will be launched in June.